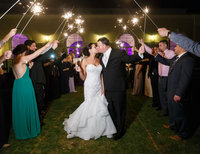 Dana and Matt’s wedding took place at the beautiful Wadsworth Mansion in Middletown CT. The nineteenth century Beaux Art style mansion was a stunning location for both their ceremony and reception. A rainy morning cleared just in time for a first glance and portraits overlooking the mansion’s gorgeous grounds. Although the rain prevented the outdoor ceremony they had planned, an elegant ballroom provided a beautiful option for their exchange of vows. An intimate reception followed shortly after where friends and family toasted the newlyweds and danced the night away. Congratulations Dan and Matt!